1. 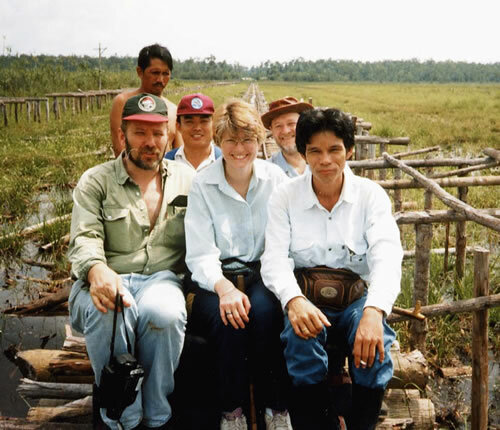 Peat swamp forest is an important and sensitive dual ecosystem – rain forest and peatland which is influenced strongly by the characteristics and nature of the peatland component. 2. There is a lack of understanding of the ecological complexity and biodiversity of these complementary system and the natural resource functions which they perform. Remote sensing should be used as the tool by which to carry out extensive landscape surveys and prepare large scale classification and distribution of peat swamp forest types and of peatlands of different hydrology and thickness. 3. The role of peat swamp forest in the maintenance of regional biodiversity (including endangered and rare species of animal and plants, e.g. orang utan) and as contributors to local economies (timber and non-timer products) and regional and global environmental processes (e.g. climate and carbon store) should be recognised. 4. Priority should be given to establishing legally protected areas on tropical peatlands for wildlife conservation embracing, wherever possible, entire catchments and intervening watersheds. 4.1 In order to achieve these the Kalimantan Peat Swamp Forest Research Project (KPSFRP) should be supported and extended to obtain the required data using the resources already available at the University of Palangka Raya and in collaboration with experts from the Universities of Nottingham, Leister and Hokkaido. 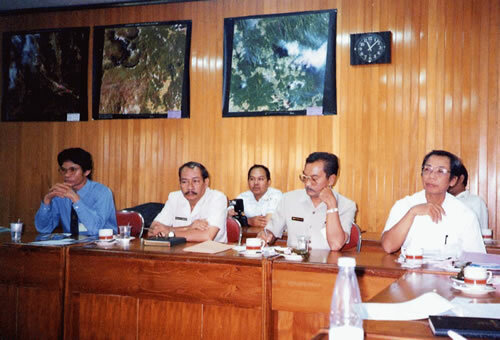 4.2 There is an urgent requirement for the establishment of a “Natural Laboratory for Study of Peat Swamp Forest” to provide the Indonesian and International focus for the study of the natural ecosystem and base line information against which to evaluate the impact of development projects. This should be located in the upper catchment of Sg. Sebangau where preliminary studies by the KPSFRP have already been carried out. 1. Development projects must proceed gradually and be limited by existing level of technological and scientific knowledge, especially with regard to agronomic, economic and ecological viability. 2. Integrated catchment management plans should be prepared using techniques of remote sensing and a Geographic Information System (with particular reference to hydrological budgets and integrated landscape planning). 3. Original research into the natural and developed systems must proceed simultaneously, transferring knowledge and expertise from one to the other. 4. Monitoring and research programmes should be established to address problems of hydrology, peat fertility and substrate conservation etc. 5. Peats of more than 3 meters thick should not be developed until more knowledge on the advisability of this is available. Likewise, shallower peats should be protected where they overlie inherently toxic or infertile substrates (e.g. potential acid sulphate substrates, quartz sands). 6. The unique character and inherent heterogeneity of tropical peat soils should be recognised and studied; more information is required on their long term agricultural potential, sustainable management and conservation. Knowledge of mineral soil agriculture cannot be transferred directly to peat soils and new agronomic systems need to be devised. 7.1 Ecological and environmental information on the probable impacts of this development should be made available from the Kalimantan Peat Swamp forest Research Project. 7.2 An exploratory expedition should be made of the catchment upstream of the one million hectares area to address potential problems of water supply, storage, and purity together with any other unsuspected impacts, the location and size of buffer zones should also be considered. 7.3 Routine monitoring, of key aspects of the development (e.g. hydrology, hydrochemistry, microclimate, agriculture) should be carried out by staff of UNPAR and other Kalteng institutes after suitable training. The information collected should be evaluated at Discussion Forums attended by representatives of all interested parties. 7.4 Establish a programme to publicise the importance of peat swamp forest, and the objectives and benefits of the one million hectares project. Community awareness and participation activities should also be undertaken. 1. 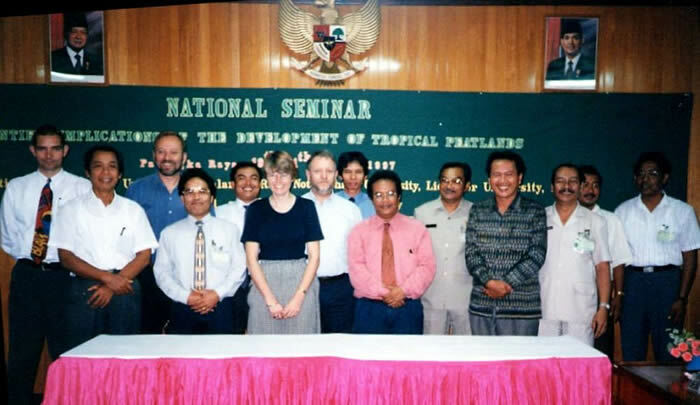 Following establishment of the “Natural Laboratory” its activities should be integrated with and operate in parallel to those of the Tropical Peat Research Centre (TROPEAT) in Pontianak, West Kalimantan to form a unified International Tropical Research Centre focussing on both natural and development aspects of tropical peat. 2. An Indonesian national network of peatland scientists, developers and users should be set up in order to circulate information, ideas and news on Indonesian peatlands. This can be linked into international networks through the Kalimantan Peat Swamp Forest Research Project, the Natural Laboratory and the International Peat Society.